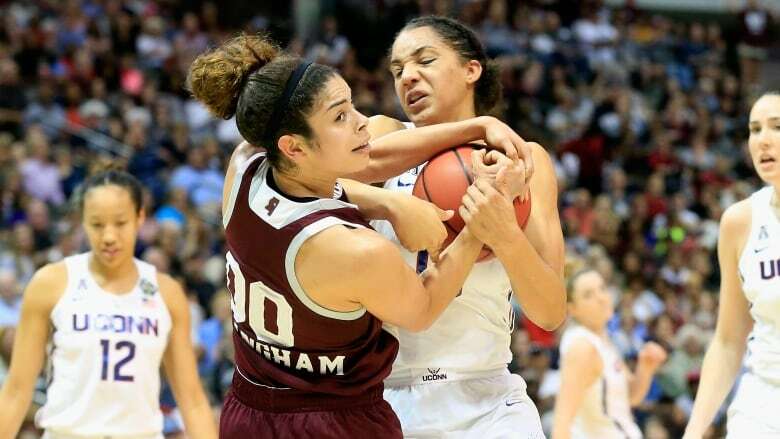 UConn's record 111-game winning streak came to a startling end when Mississippi State pulled off perhaps the biggest upset in women's basketball history, stunning the Huskies 66-64 on Morgan William's overtime buzzer beater in the national semifinals Friday night. Hamilton's Kia Nurse had six points and set a new NCAA Tournament record with a pair of three-point field goals. "I live for moments like this," William said. "UConn, they're an incredible team. For me to make that shot against them, it's unbelievable. I'm still in shock right now. I wanted to take the shot. I wanted to take the shot and I made it." UConn coach Geno Auriemma had a wry smile on his face after the final shot. There wasn't much else he could do, the chance for a fifth straight national title suddenly beyond his grasp. "We had an incredible run, but we came up against a much better team tonight," Auriemma said. Mississippi State (33-5) and UConn met in the Sweet 16 last season and the Huskies won by 60 points — the most-lopsided win in regional semifinals history. All season long the Bulldogs had that humiliating loss on their minds. Now they've erased that defeat, beating UConn (36-1) on the grandest stage in one of the sport's greatest games. "I don't have to play them 100 times. Only have to beat them once," Mississippi State coach Vic Schaefer said. "That is one heck of a basketball team, the greatest of all-time. But how proud am I of my kids?" The Bulldogs ran onto the court, piling up at center court while UConn players stood stone-faced. Schaefer grabbed William in a bear hug, with former Mississippi State star Dak Prescott — the Dallas Cowboys quarterback — helping lead the cheers. Prescott said he'd try to come back Sunday for the title game. UConn rallied from a 16-point deficit, its biggest during its NCAA record streak, to take a 59-56 lead in the fourth quarter. The teams were tied at 60 when the Bulldogs had a chance to win it in regulation, but William's shot was blocked by Gabby Williams, sending the game into overtime. "Maybe we're just not ready for this. Maybe we were ready for everything else, but maybe we're just not mature enough for this," Auriemma said. "Maybe all our young kids needed to experience this so that we can come back and really be ready for this." Neither team scored much in OT with Teaira McCowan's layup with 1:12 left in the extra session breaking a 62-62 tie. It was the lone basket for Mississippi State in OT until William's game-winner. During their last two decades of dominance where they've won 11 national championships, the Huskies rarely found themselves trailing — let alone by double-digits. This was the first time this season that UConn was losing in the fourth quarter. The Bulldogs got off to a great start, taking it right at the Huskies unlike many teams had done during the streak. The Bulldogs led 15-13 before scoring 14 straight points to go up 29-13. It was the biggest deficit UConn had faced during its historic streak and one of the largest during the last 22 years, which the Huskies have dominated with 11 national championships. UConn came back in the third quarter behind its trio of All-Americans with Williams, Napheesa Collier and Samuelson keying a 12-3 run to start the second half. That run brought Huskies alums Sue Bird, Breanna Stewart and Maya Moore, who were sitting 20 rows behind the UConn bench, to their feet.